The circus is over. On a technical level, there is little to say. The winners are the Five Star Movement and Salvini’s Northern League. The heaviest loser was Renzi’s Democratic Party, which took a real beating. At the moment no-one has a majority, and so a second round of the same farce will take place as they try to forge alliances. Both Salvini and Di Maio swear they won’t make back-room deals, though they’re both watching each other out of the corner of their eyes. The possibility of any coalition is tiny so the technical job of the government either will be given to one of the winners, Salvini or Di Maio, or might even be handed back to Gentiloni as caretaker for six-months, after which there’ll be a new electoral law and the whole show can start again. Undoubtedly the winners were the populists and the “we want out country back” types who played the fear card and shouted about autonomy, while Renzi’s Democratic Party collapsed miserably. Electoral analysis shows that voters who abandoned Renzi’s party went to the Five Star Movement and the Northern League, and that this is the reason for the defeat of the so-called Left. But is there more to it than that? The fact is that times have changed. Capitalism is no longer what it used to be. Neither the proletariat, nor those political forces who represented it (or at least believed they did), adapted to the new state of affairs. Capitalism is openly experiencing great difficulties on its road to valorisation. Speculation, or rather the attempt to get more profitable financial rewards outside the mechanisms of production, just leads to one speculative bubble after another and drags capital away from the real economy. The consequence of all this is clear for everyone to see: economic crises; financial crises; wars; international tensions; barbarity against civilian populations; the looting of the environment, etc. etc. The proletariat, apart from being broken up into dozens of subcontracted categories, has lost its productive ‘fortresses’. Decentralisation and relocation in the search for ever lower wages, has led to the break up of working class ‘unity’ with the consequent loss of its ideological compass. The process of decomposition of the working class has been accompanied by the collapse of political myths: such as the implosion of the USSR or the growth of the Chinese monster, which for some was a ‘second beacon’ of world communism when in fact was its opposite – a ferociously capitalist country hell bent on exploiting its own labour force and that of its neigbours. This is the scenario which has overwhelmed the so-called Left. They’ve been overtaken by both domestic and international events. 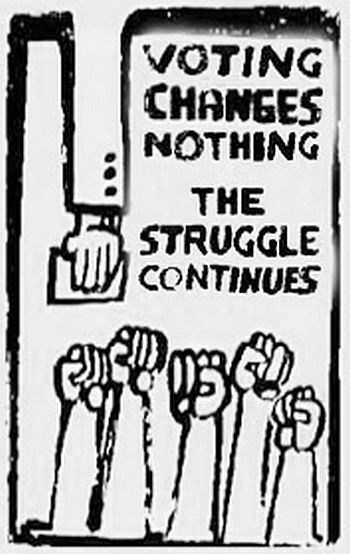 On the domestic front, not only is capitalism unable to concede a few crumbs to the proletariat from its increasingly meagre profits, but it has been forced to attack the living and working conditions of millions of workers, those same workers that the ‘development’ of capitalism has, over the years, turned into the super-exploited, the unemployed, or just part of the precarious workforce. The traditional unions have hidden behind the skirts of the system, emerging only to co-manage wage levels with the bosses. The parties of the traditional left, with the CP at its head, were overwhelmed by phenomena they were unable to understand, let alone manage, and have been swept away like pebbles dragged downstream by a current too strong for their light weight. The so-called avant-garde antagonists (the name already speaks volumes about their political strategy) look with nostalgia more and more to the past, a past they never understood, rather than to the future. It’s from here that we need to start to understand the meaning of yet another defeat for those elements (who knows what they believe) who still claim to belong to the left. The issue is not Salvini and Di Maio, who the bourgeoisie use to keep the fragments of the system together, but the disappearance of the left and its soft appendages. This once reformist left, despite having, in part at least, roots in the tradition of the October Revolution, had its branches in the Stalinist sky, and called again and again for the usual nationalisations, the state take-over of the banks etc, without touching the heart of capitalism, or the relationship between capital and labour. This left is dead because it has been sucked into the economic and political mechanisms of the bourgeoisie. This phenomenon hasn’t just happened in Italy but in half of Europe and in other Western countries. It died because, from the 1920s on, it abandoned the path of revolution and anti-capitalism. It is dead because it denied its past, the reason for which it was born. It died because it couldn’t even stand up to the impact of the capitalist crisis, even though it proved to be its most effective remedy, calling on the proletariat to give its blood to a sick capitalism in its hour of greatest need. It died because, after betraying its electorate so many times, after politically humiliating them, without giving them a minimum of political class perspective, without giving them alternatives to the system that exploits them, this electorate went where their political despair took them. For communists and revolutionaries who, for decades, have denounced the decadence of this system and called for its overthrow, who have made opposition to the ballot box and the whole electoral circus a necessary condition of maintaining our distance from the system, this distance is absolutely not enough on its own. The problems of exploitation and wars aren’t solved by refusing to vote for the Salvinis, the Di Maios and the Renzis of this world. Abstention alone only involves resignation and sterile disenchantment. Capitalism and its barbarism can’t be fought with a ballot card. Writing an ‘X’ won’t tear the knot that binds the infamous relationship of capital and labour together. It’s necessary for the class to rediscover its unity, to work politically for the revival of the class struggle to strengthen its own political party. Otherwise millions more cards will slip into ballot boxes so that the bourgeois parties can alternate in new governments whether of a technical or political type. Whatever the outcome the whole farce weighs heavily on the working class, the class which produces the profits, goods and services for those same bosses who call on us to join the ‘great democratic consultation’ whenever they get into difficulty and need to change the crew of the ship. But in the meantime, it’s the same slaves that keep on doing the rowing. A tiny error in the last para...will slip into ballot boxes with so that.. I am ever more convinced that there are only two possible futures. An explosion of exploitation, oppression, war and environmental destruction, or the unleashing of untamed revolutionary energy. I think Marxism itself has contributed to illusions in gradual stages, steps to be taken between moribund capitalism and proletarian power. These perspectives were largely corrected by Marx and Engels themselves as they understood the reformism of the communist manifesto was no longer applicable even then, nor was it possible to utilise the capitalist state but it had become necessary to replace it by a new proletarian power. However I think that the concept of expanding productive forces and conserving a system of individual reward as embodied in the labour time voucher also stands as an obstacle to untrammelled revolutionary destruction of commodity production. I understand this is not a historic left communist position but I am ever more inclined towards socialism from below, a massive and immediate end to measured individual input and consumption and production which is immediately social and collective in its intent. Immediate communism, however rough and in need of polish. As the article clearly states the left, third ways, intermediate forms, mixed economy and the like which conserves the capitalist corpse in part, is a spent force. In itself this is nothing to lament. It simply has to be. Thanks for the correction. Yoour comment re labour time vouchers would be more appropriate in the Discussions on Socialism thread (see top of the right hand column). For some unknown reason, the article on ltv does not allow comments. I think you can see that I am struggling on the issue and that I realise recipes for the future are difficult at best. i read between the lines that your lack of a strong condemnation of my perspective means that you too suspect it may be a viable one, that the preservation of the law of value to the extent that it his occurs when ltv are used thus relating individual consumption to individual input and shaping production in that direction, is possibly a response to primitive capitalist conditions rather than a universal and permanent established historic stage. Again I will underline that I have no crystal ball and hope the way I present this is not seen as an attack on a well intentioned organisation.